Would you like to break with existing patterns? Are you looking for the definitive escape from the negative spiral? Do you have a project or team that is in trouble? With ‘The Works’ trainings and workshops teams will be better equipped and more capable to achieve break through changes, to eliminate bureaucracy, to make measurable sustaining improvements. The outcome of the sessions will always be shared by the team and accepted by management. The trainings and workshops result in SMART goals and documented controls, as fixed part of an optimal plan of approach, ensuring the expected result will certainly be reached and secured. ‘The Works’ sessions take from half a day to several days, depending upon the issue at hand. One subject (e.g. root-cause, or QFD) usually takes from half a day to one day, also depending upon the capability of the participants. 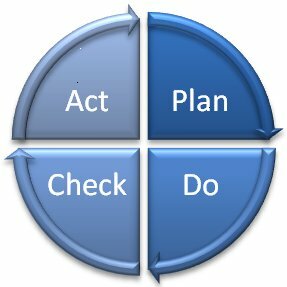 You can come from a problem statement to a complete and committed plan of action in a relative short period of time by creating a logical combination of sessions (What > Why > How > When).